Pure Heaven Cotons has dedicated ourselves to breeding loving, healthy and beautiful new pack members. Breeding Cotons is a passion of ours and insuring that the lines and heritage of this lovely, funny and loyal dog are upheld to the highest standards possible is our primary mission. That is why all of our sires and dams are OFFA health tested and come from champion bloodlines. We have mentored with some of the best breeders in the world. All of our Cotons are bred to the FCI Standard and all of our Coton pups are socialized, vet tested and ready to join your home as a new, loving member of your family. 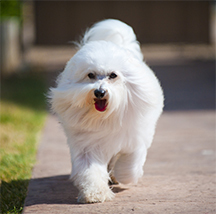 As you may know, the Coton de Tulear is a rare breed of dog with a colorful and wonderful history and this small to medium sized breed is perfect for any home environment, from single apartments to giant mansions. This breed is also hypoallergenic, which means it is safe for families with members that might be allergic to most breeds of dogs. Because of the ethical breeding programs that we and other NACA breeders follow, there are very few genetic issues with Coton de Tulear which is why they can live upwards of 17 years if properly cared for! We hope to hear from you soon.